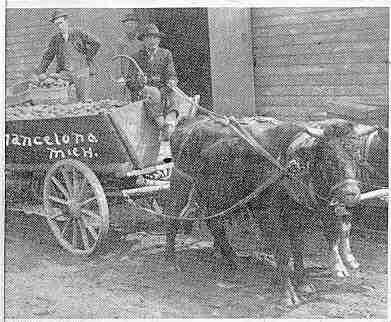 After 1880, the village of Mancelona grew rapidly. Its manufacturing interests consisted of a butter dish factory, sash, blind and door factory, broom handle factory, sawmill and planning mill. In the spring of 1881, a board of trustees was organized. This board consisted of Josiah Potter, S. M. Bean, S. F. Hill, E. Elkins, A. J. Jackson, Perry Andress, and J. E. Glines. Also a building committee was appointed to plan a new church building and the work commenced. The members besides those mentioned above were: James L. and Mary Farnham, Wakeman and Laura David, Mr. and Mrs. George J. Kellogg, W. R. Rice, Frank and Amelia Besaw and Lucy Marsh. 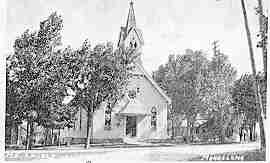 The church edifice was dedicated October 22, 1882. The cost was $2300.00. At a meeting held in the town hall October 10, 1882, a Grand Army post was organized and the name of Gen. Lyon, who was killed at the battle of Wilson Creek, MO., on August 10,1861, was chosen as the name of the post, it being called Lyon Post No. 86, G.A.R. Mancelona I.O.O.F. was organized in the fall of 1882. A Masonic lodge was instituted early in the year 1884 and there was also a Good Templar's lodge that had been in successful operation about two years in the village at that time. The present American Legion Post, No 264, was organized August 1, 1920, in honor of George Puckett, who was killed in service in the Argonne Forest, France, on November 8, 1918. John Otis came to Mancelona in 1882, and in partnership with James Otis and R. M. Cherrie, erected and operated a blast furnace for the manufacture of charcoal pig iron at Furnaceville ( now called Antrim). The huge stands of maple and other hardwood timber needed in the making of hgh quality iron were close at hand and the iron ore could be shipped in by rail at small cost. Mr. Otis set out to build a model community for his workers. He platted the present Village of Antrim, then called Furnaceville, and proceeded to sell lots as well as build houses to rent to him employees. However, in May, 1883 the furnace and all the main buildings were consumed by fire, causing a loss of about $40,000, and work was suspended until September, when Mr. Otis resumed the enterprise himself. By 1884 he was employing about 150 men and manufacturing forty to fifty tons of iron per day. About this time, Moore and Stowe built the first sawmill to furnish lumber to the booming Grand Rapids furniture industry and the Berry Brothers built their first chemical plant. In 1886, Otis sold the plant to the Antrim Iron Co., one of the largest manufacturing concerns in northern Michigan. Its products consisted of hard and soft wood lumber, wood chemicals and charcoal pig iron. The company lumbered 30,000 acres of land which they owned and purchased timber from an additional 10,000 to 20,000 acres lumbering, in all, between 40,000 and 50,000 acres. All of this was virgin timber. The logging camps included two at Coldsprings, Barnhart and Gorham Camps 4, 9, and 8 and 31 in Otsego County and Camps 10, 16 and 24 in Antrim County. There were a great many camps, some large and some small, for the cutting of cordwood, located all over this section and in the upper peninsula. The company had a large farm on its premises and also owned and operated the only store in Antrim. The plant employed over 500 men at the height of its production. The first manager of the plant was a Mr. Fitzgerald. Succeeding him in their order were Nelson Langdon, S. Katzenstein, R. W. Durrett and L. S. Baldwin. The furnace, one of the largest in Michigan, ceased operation in October 1943. The sawmill closed two years later. In December 1882, the Mancelona Herald wrote this of the village: "Mancelona gives good evidence of thrift, and is rapidly improving in a business point of view...the Methodists have a very fine house of worship just approaching completion...The new smelting works being erected here will be a great acquisition to the town". A little later the paper contained the following: " In Mancelona there are ten stores, one of the best hotels in Northern Michigan, post office, printing office, two restaurants, hardware and tin shop, express and telegraph office, meat market, two drug stores, millinery store, gun shop, shoe shop, sawmill, shingle mill, two blacksmith shops, good schools, etc... There is a large handle factory with a capacity of 8,000 broom handles per day...A beautiful town hall, costing about $2,000 has been erected, which adds much to the beauty of the town...There is an established stage route from Mancelona through the central portion of the county to Eastport at the head of Torch Lake, 28 miles from Mancelona. There is also a mail route to Stover, a thriving little village seven miles northwest. Mancelona contains about 500 inhabitants". The Mancelona Township Library was founded about the year 1883 and had its location in the former town hall. Daniel Foote was one of the librarians, taking the position while still going to high school. The library was moved to its present location in the year 1916, after the completion of the present Carnegie Library Building. On August 12, 1886, practically the whole business section of Mancelona burned in a fire originating in the Mancelona House and spread from one building to another because there was no facilities for extinguishing the flames. It was a total loss in a great many cases, but almost immediately it was rebuilt with brick buildings and the street was widened. The Mancelona Herald printed a special edition on a hand press in the street less than 12 hours following the fire. March 5, 1887 work began on the Pleasant Grove church. It was dedicated January 8, 1888 at a cost of $700.00. In 1893 a chapel was built an Antrim at a cost of $500.00. It was dedicated by the Reverend Dr. Ball on August 2, 1893. The same year the old parsonage was sold and the present one was erected. The Women's Foreign Missionary Society and the Ladies Aid Society were organized in the early years of the church. The Epworth League was organized in 1889 during the pastorate of Rev. G. S. Robinson with Miss Minnie Plummer the first president. Other early E. L. presidents were Hannah Hobbs, Laura Braman, H. W. Smith, Emma Watkins, Mark Freeman and Dora Underwood. The Junior League was also organized about that time with J. A. Smith and Phoebe Clark, and Anna Browning as acting officers. In 1894 by the generosity of Mr. C. E. Blakley a class room was added to the church at the expense of $306.00. During the years the name has changed from Methodist Episcopal Church to First Methodist to the present United Methodist Church. See photo below. In 1889 the village of Mancelona was incorporated with William H. Thompson as its first president. E. L. J. Mills, in 1891, came from Mayville and helped promote and organize the Antrim County State Savings Bank with a capital of $20,000. This institution has from the beginning enjoyed a very satisfactory patronage. In 1892 the banking company erected the brick building they now occupy.